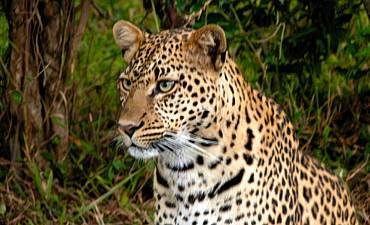 Are You Planning A Honeymoon Safari To Tanzania? Scroll Down For Details.. Your honeymoon is the foundation of celebratory love after exchanging your marriage vows, leading its ways into your married life together. It is important enough to be worth a great deal of effort to make it a perfect memory after your wedding and to carry you through the years that lie ahead but with the reliance of an expert honeymoon planner for a non-glitch experience. AfricanMecca has precedential tailor-make expertise and personal experience in hand-picking small, romantic accommodations in pristine safari and beach destinations that results in superlative dream honeymoon safaris of Africa -- the ultimate outback for passion and adventure, a place to be alone together and to delight in the unspoiled natural world around you. AfricanMecca recommends a honeymoon starting with a relaxed, private location to chill out after the wedding excitement and long haul travel, where you can get to know each other, undisturbed by anything more than the night calls of ambient wildlife and birdsong in the morning. 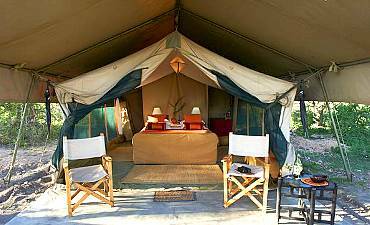 Stay in a tent or banda, in a tree house or a recreation of a colonial expedition safari, an African boma, a sophisticated Art Deco or a bohemian villa, a country bush home, or a fly camp tent separated from the stars only by a mosquito net. Spend time in united activities that bring out the spirit of adventure in both of you. Sharing fun, laughter, effort, new discoveries and achievements are the best way to begin your new life together. How do you prefer to relax? 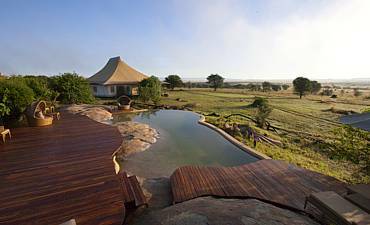 Do you imagine lounging on a sundeck beside an infinity pool overlooking a waterhole visited by elephant and varied antelopes? 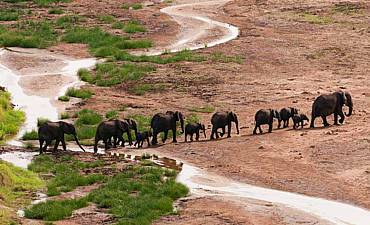 Visit Sanctuary Swala on a tour of Tarangire with AfricanMecca. Can you see yourselves walking hand in hand along a silver beach, fringed with palms, beside an azure sea? Both The Palms and Baraza in Zanzibar are premier high-end, luxury residences set in magnificent gardens with impeccable personal service and beautifully presented cuisine with an option of a private plunge pool. 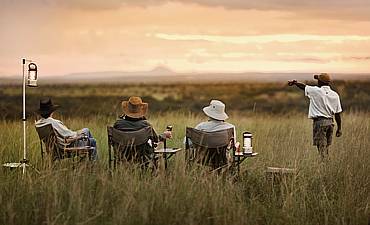 Does a campfire in the bush appeal to you or a full silver service dinner with champagne by candlelight beneath an African moon? 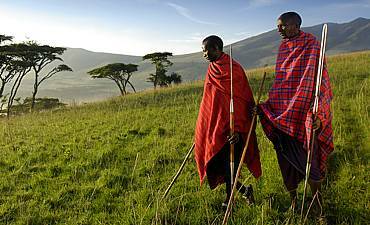 Sample a flamboyant Maasai and mainland fusion with a view of Kilimanjaro at Shu’mata Camp. Do you see yourselves toiling up Kilimanjaro on an active honeymoon, canoeing on the stunning Momella lakes among stilt-legged pink flamingos or snorkeling amongst brilliant fishes on a coral reef in Pemba? 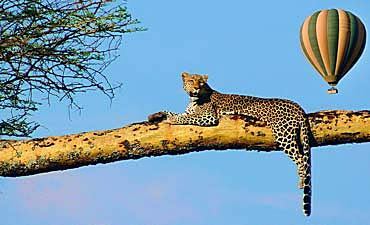 All these ideas and more are possible on a honeymoon safari in Tanzania. 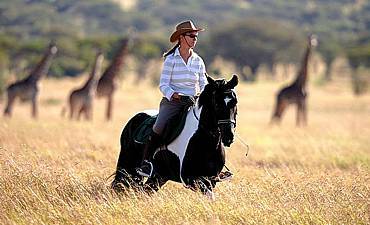 Horse-riding, tennis, archery, bird watching, game walks on the veldt, following the Great Migration in a customized 4x4, tracking chimpanzees on Mahale Mountains, joining a Maasai dance or a special blessing ceremony, or even enjoying a Serengeti hot air balloon safari ending in a champagne breakfast with a sensual massage on your return. You could start in Arusha and relax by Lake Duluti Lodge, a tranquil experience before heading out with your private AfricanMecca guide to an English cottage destination retreat at Gibbs Farm in the Ngorongoro Highlands, with well-loved gardens attracting speckled birds and butterflies, and fresh, healthy food from the organic home farm, and a choice of herbal treatments from a Maasai practitioner. 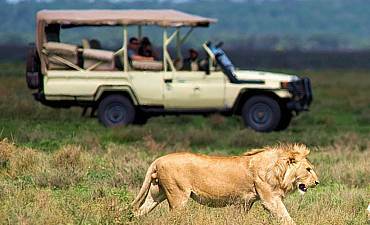 Or opt to drive to Ngorongoro Crater Lodge, a fantasy Versailles wilderness chateau on a volcano rim overlooking a “Natural Wonder Of The World” and a UNESCO World Heritage Site, where you can possibly see all the Big Five in one day’s game drive. 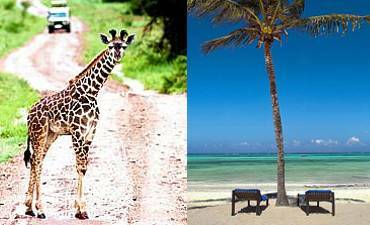 Would you prefer a treehouse besides the stunning Lake Manyara or in Tarangire, and a glorious Lupita Private Island villa in the south of Lake Tanganyika, accessible only by air and boat? On the east of the lake, Greystoke Mahale is a rustic chic base for a primate chimp tour in lush tropical Montagne forest. 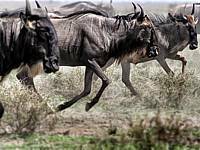 Migration Camp in eastern Serengeti boasts of richly furnished tented suites on a rocky outcrop above the plains where more than a million wildebeest, zebra and other ungulates pour through a game corridor on their annual migration in search of grazing grounds and water. It is an awe-inspiring spectacle, life-changing in its impact as they flee from predators on land and brave the giant crocodile infested Mara and Grumeti Rivers. 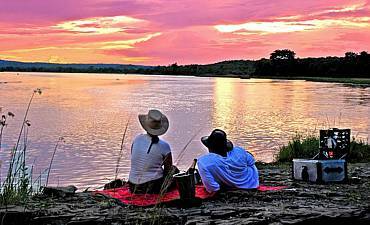 For a true Tanzanian wilderness vacation in the vast Selous Game Reserve at Lake Nzerakera, adjoining the Great Rufiji River, Siwandu Camp comprises of unfenced, secluded tents on stilted wooden decks. A myriad of birds frequent the camp. Elephants and hippos wander at will. On an escapade romance expedition in remote Katavi, an amazingly luxurious ambience is contrived at Palahala Camp, where nature is spectacularly merciless in the dry season and water has to be hauled in by bowser. 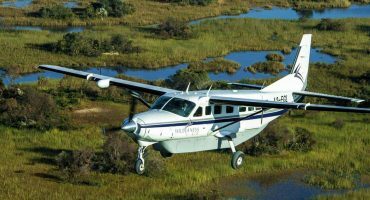 For the ultimate in self-reliance, try fly-camping from Jongomero in little-visited Ruaha, utterly alone in a wilderness destination the size of a small country where few other humans have ventured. Lions, wild dogs and cheetahs hunt dry plains dotted with palms and medusa-headed baobab trees whilst lush forests with ferns and orchids are haunts of rare sable, road and kudu antelopes. Finish with Tanzania beach honeymoon with more relaxation at Ras Kutani Lodge on the south coast of Dar es Salaam, with wellness and massage treatments, surfing, body boarding, and kayaking on a freshwater lagoon behind the white sandy beach, nature walks in the forest, horse riding and fishing. 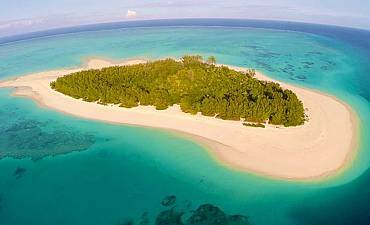 Or you could end your barefoot and passionate beach holiday at the magical Mnemba Island, beside the Indian Ocean on the northeast of Zanzibar, in a thatched beachfront banda beside the clear turquoise seas where it is a delight to snorkel and dive off the atoll reefs or swim with dolphins further south. You may meet Suni, Bambi-like antelopes, by a forest path, or a clutch of baby turtles churning through the sand into the sea. AfricanMecca will arrange an informed, seamless, trouble-free Tanzanian romance vacation itinerary regardless of your budget that leaves you without the stress of organization; free to passionately revel in the honeymoon of your dreams. 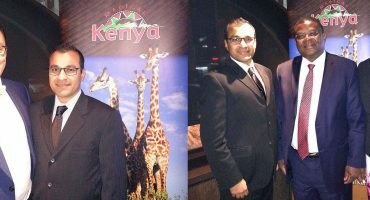 Think Africa, Think AfricanMecca when planning your nuptial trip. 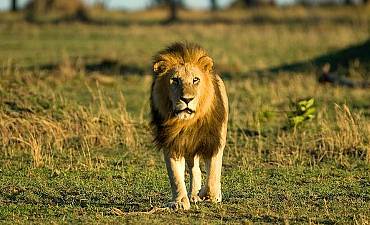 What do you want from your dream safari in Tanzania? Beautiful scenery? Fantastic wildlife? The ultimate freedom of returning to primeval forests, soaring mountains, timeless lakes, endless plains? 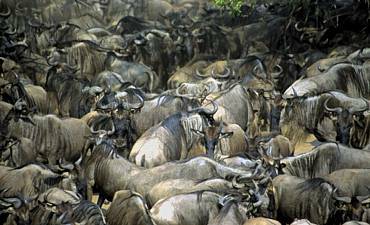 The best way to ensure a discerning safari in Tanzania is to engage AfricanMecca in organizing a customized tour, tailor-made with an option of a private guide and exclusive transport just for you. AfricanMecca has the bespoke expertise and experience in hand-picking small, romantic accommodations in pristine safari destinations that results in superlative dream honeymoon safaris of Tanzania. 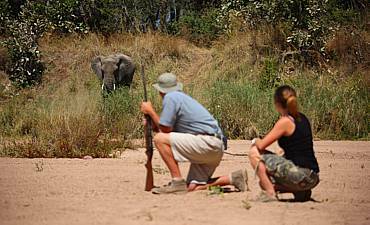 A family safari binds you together in shared gratitude and wonder. Parents and grandparents sharing a Tanzanian wildlife and cultural safari with their generational children is an enriching experience. The supreme safari luxuries of Tanzanian wilderness experiences are never to be forgotten self-indulgence on a spectacular scale. Each rustically boutique camp offers something differently richer. An AfricanMecca photography safari in Tanzania puts you in the care of a hand-picked photographic instructor so that you will learn how to get the very best out of your camera during your game drives. 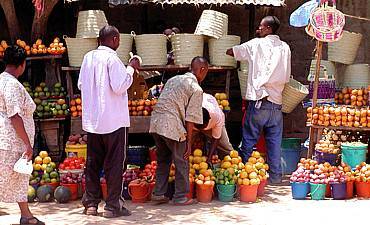 We believe the cultural diversity of Tanzania is one of its greatest strengths. By meeting and understanding people whose views and values are very different from your own, you acquire new insights. 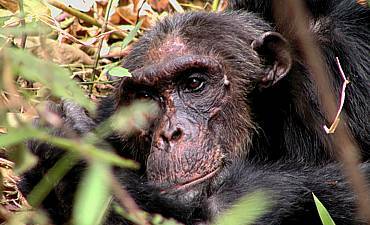 The most popular primate safaris in Tanzania with AfricanMecca are in Gombe and Mahale, sites of intensive studies of chimpanzees, mankind’s closest living genetic kin with 95-98% of DNA in common. Walking safaris in Tanzania embraces you with the landscape and the wildlife, disturbing it as little as possible, and becoming just another animal, alert and aware of every nuance of wilderness. 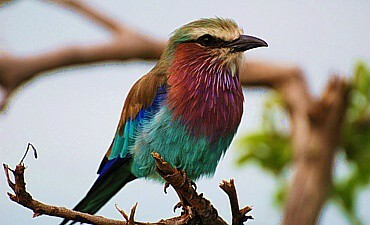 Tanzania is one of the best bird watching destinations in Africa, with over 900 resident species and 200 migrants present. Birding is best in the rains for migrants and residents in breeding plumage. 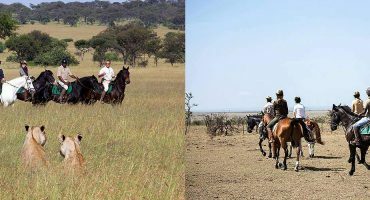 Horse riding safaris in Tanzania are conducted in private wildernesses, yet it is a distinct way to immerse yourself with the pristine landscape, diverse wildlife, fauna, and the indigenous people. A balloon safari in Tanzania is a fantastic once in a lifetime experience, particularly suitable for a bird's eye-view game viewing experience on your wildlife tour in Serengeti and Tarangire. 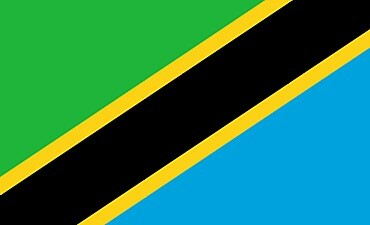 The awesome beauty of Tanzania offers many venues for a dream wedding. 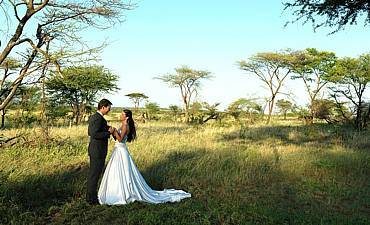 Have your bridal vows in the bush with nature's bounty all around. 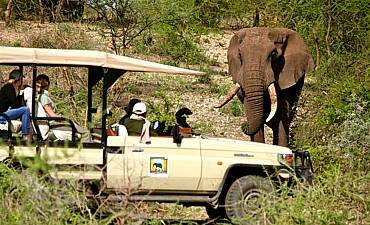 Confess with AfricanMecca Safaris to make every dream come true.